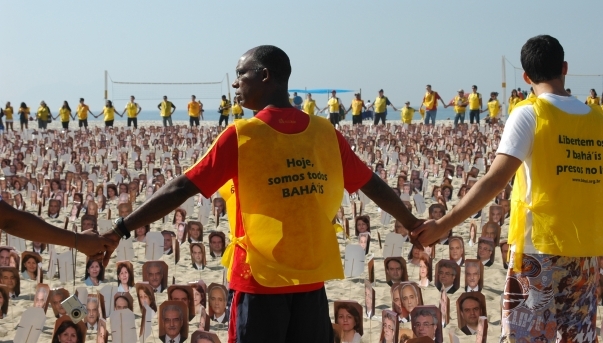 RIO DE JANEIRO, Brazil, 20 May 2011 (BWNS) – Representatives from government, religious communities and civil society organizations were among the 800 human rights supporters who gathered to call upon Iran to cease its persecution of Baha’is and other religious minorities. Participants traveled from all over Brazil to take part in the rally, held at Rio’s Copacabana Beach yesterday, some spending up to 15 hours on buses to get there. Almost 8,000 images depicting the faces of Iran’s seven imprisoned Baha’i leaders were on display at the beach, corresponding to the number of days of detention the seven had suffered after three years in prison. The photographs were arranged in a large circle, representing the world, and the union of people of all races and nations. The crisis and victory keeps going hand in hand in response to the violations of human rights of the Baha’is of Iran. It is so wonderful to see that people of all backgrounds and nationality are speaking up with the loudest voices any deaf ear can hear!! Baha’i communities all over the world are posting this wondrous news. The complete story is reported on Baha’i World News Service. What a beautiful picture of humanity in Rio. The Baha’is of Iran are not the only ones who feel loved and supported by this massive show of solidarity for their human rights, everyone, all over the world feels encouraged and empowered knowing that people of good will every where make it their business to stand up for human rights and what is right. The message of Baha’i Faith is about love and unity, knowing and loving. Once put into practice, these teachings will liberate humanity from the grips of the cruelties and ignorance of dark ages practiced today in the name of religion. When it comes to being civilized, Iranian Islamic Republic Regime has many role models to emulate. The people of Iran deserve a whole lot better than rule of inhumanity. Please share this solidarity and speak u for human rights. Ask the children to write their thoughts and feelings about what the Iranian Regime is doing to its citizens and what Brazilian people are doing for human rights. This entry was posted in human rights, News and tagged Bahaís of Iran, Human rights rally in Rio, Islamic Republic regime of Iran violates human rights of Baha'is, one thousand in Rio support human rights. Bookmark the permalink.